Oct. 31, 2018 — Now more than halfway through the early voting period in the 37 states that offer early voting options for the populace, some places are turning in record participation rates. Each state has various nuances in their early voting procedures, so comparing the early reports to each other is of little value. Going back to contrast the current 2018 reported numbers with how that particular state voted in the last midterm election (2014) does have significance, however. 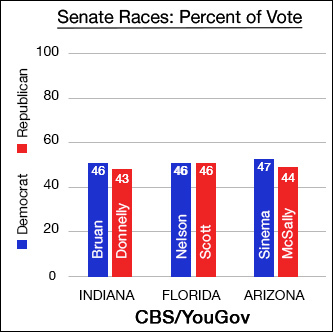 Oct. 30, 2018 — CBS News/YouGov just published new numbers from three key Senate races, all conducted late last week during the Oct. 23-26 period, that largely confirm recent trends. The Indiana race has seemingly turned toward Republican challenger Mike Braun in recent days, and the CBS/YouGov poll confirms the new direction. 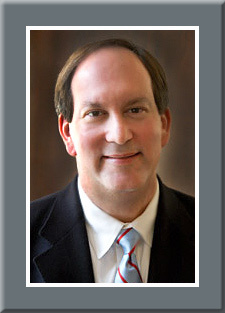 According to their poll (975 likely voters, online), Braun holds a 46-43 percent lead over Sen. Joe Donnelly (D). This is wholly consistent with other polling conducted since Oct. 14. As we reported last week, Mason Strategies (Oct. 15-20; 600 likely Indiana voters) finds Braun up by an almost identical 47-43 percent margin, while American Viewpoint in polling for the Braun campaign (Oct. 14-17; 800 likely Indiana voters) sees a 44-40 percent spread. CBS/YouGov then surveyed, as so many others have done recently, the Florida Senate race. After Sen. Bill Nelson (D) went ahead beyond the margin of error over Gov. Rick Scott (R) in a pair of polls, two more studies turned in the latter man’s favor. Then, St. Leo University (Oct. 16-22; 698 likely Florida voters), Strategic Research Associates (Oct. 16-23; 800 likely Florida voters), and Gravis Marketing (Oct. 22-23; 773 likely Florida voters) all saw Sen. Nelson rebounding with an advantage of nine, one, and four points, respectively. But, CBS/YouGov finds the race returning to parity. Their results, from a pool of 991 randomly selected and weighted online respondents, peg the race as a flat tie, at 46 percent apiece. The national media/polling partnership also tested the tight Arizona Senate race. Here, CBS/YouGov (972 likely voters) finds US Rep. Kyrsten Sinema (D-Phoenix) re-claiming an edge over Rep. Martha McSally (R-Tucson) by a 47-44 percent clip. Oct. 10, 2018 — There is great discussion within political circles about the importance of early voting and whether an advantage can ascertained for one party or another, or if it is a predictor of the associated election that is decided in the succeeding vote. 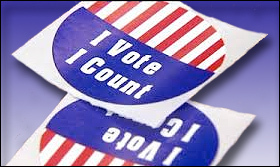 As more states adopt early voting – 37 currently have enacted some form of the balloting process – it is still unclear as to whether it brings more voters into the election cycle. Offering elongated voting times does make ballot casting more convenient, no doubt, and Democrats usually are more prodigious in their use of the procedure, but there are no long-term patterns that suggest the use of early voting actually leads to more Democratic victories. The early voting calendar is also elongating the election process, and the periods for such ballot casting are getting longer. Right now, pre-election voters in Colorado, Illinois, Minnesota, New Jersey, North and South Dakota, Vermont, and Wyoming already are casting their Nov. 6 ballots. This week, Arizona, California, Indiana, Iowa, Maine, Montana, Nebraska, and Ohio voters can join them. The states with the latest early voting start dates are Florida (Oct. 27), Maryland (Oct. 25), and West Virginia (Oct. 24). Those who exercise their right to vote early, however, do miss the critical part of the advertising campaign, which may or may not cause them to re-think and change their votes, and it is clear that early voting has altered the campaign cycle. Thus, it is relatively clear that the more decided voters, possibly meaning the most partisan from the various parties, are the ones who generally cast their votes before Election Day. The only states that carry early voting through Election Day itself are the three where all votes are cast via mail: Colorado, Oregon, and Washington. 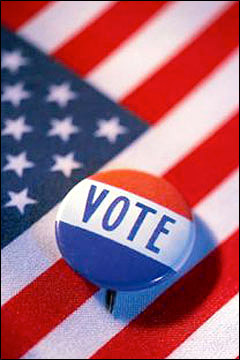 All others end early voting before the official Election Day, which is Nov. 6 this year. Nov. 1, 2016 — Hillary Clinton appeared to be a lock to win the presidency less than a week ago, but yet another email scandal has potentially altered the outcome. This time, the situation involves disgraced former Rep. Anthony Weiner’s (D-NY-9) computer from which his wife, Clinton Campaign co-chair Huma Abedin, sent and received messages that are prompting further FBI scrutiny. Does the discovery of more damaging material against the Clinton operation give Donald Trump a serious chance to win on Nov. 8? Probably not, but a new ABC News/Washington Post three-day tracking survey (Oct. 25-28; 1,160 likely US voters) finds a severe tightening of the presidential contest, and even before the latest email flap became public knowledge. The poll result finds Clinton leading Trump now by only one percentage point, 46-45 percent, with Libertarian nominee Gary Johnson receiving four percent and Green Party candidate Jill Stein attracting two percent support. While the ABC/Post analysis memorandum cautions the reader that this track represents only a snippet in time and even raises questions about the viability of its own sampling universe, the consistent movement toward Trump is still significant. It was only eight days ago that the ABC/Post track found the former Secretary of State opening up a commanding 50-38 percent advantage over the Republican businessman. Since that time, her daily tracking lead has dwindled to 49-40 percent (Oct. 24 release), 48-42 percent (October 25), 48-44 percent (October 26), 47-45 percent (October 27), and finally 46-45 percent in the data made public during the weekend.